Abu Dhabi, we have a new way for you to get around town! Careem is excited to announce that for the past year we have been working closely with our local regulators to offer you more affordable prices for your everyday travels. As as result, not only have we reduced our fares across all car types, but you can also enjoy our new Economy car type, offering you convenient and comfortable rides for as low as AED19. So, whether for your daily commute to work, your trip to dinner with friends, or your night out to the movies, book your Economy ride within minutes! And, if you’re thinking of getting a ride to Dubai, we’ve got you covered as well, with fares for as low as AED330 with Economy. What is your most affordable car type? Our Economy car type is now our most affordable service. With a minimum fare of AED19, previously at AED40. Will other car types also have reduced fares? 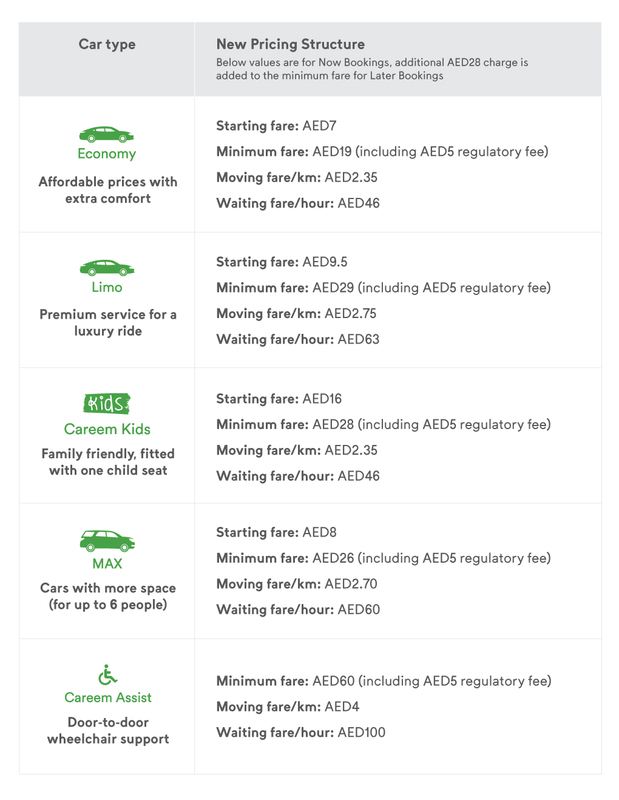 Yes, based on the new regulation in Abu Dhabi, Careem has reduced its rates across all its other car types and is now offering a wide range of services at affordable fares. What will be the impact on quality? We are committed to offering all our customers high quality service across all our car types. All our captains are trained to meet the same standard of service. What will be the difference between Limo and Economy? As a more premium service, the Limo car type offers newer model cars and our top rated captains. Will tax be applied similar to Dubai? Yes, taxes have been included in the new rates to abide by the UAE Tax laws. Is there a regulatory fee charged? Yes, it will be AED5 per trip. Will peak apply in Abu Dhabi? Peak is a mechanism that allows us to better match supply and demand at times of high demand and will apply accordingly in Abu Dhabi. How can I see a trip estimate before booking the ride? When you select the car type and enter the pick-up and drop-off locations, the fare estimate is automatically displayed just above the “Yalla” button. Have the fixed rates to Dubai changed? Yes, we have reduced the rates accordingly. Through the Economy car type you can now take a trip to Dubai for as low as AED330. Will I still receive promotions with this price decrease? We will continue to run promotions in the market with partners and through the Careem platform in the most suitable way for the Abu Dhabi market. Can I still use packages? Yes, packages are still available in Abu Dhabi on the Careem platform. Revised terms and rates will be updated on the app in the next few days. What are the new rates? Waiting fare is charged only when the car is moving below 16 km/hr. Does Careem operate across all of Abu Dhabi? We are currently growing our supply in Abu Dhabi to provide a reliable service to all. In the meantime, and to ensure we offer reasonable waiting times our captains are mostly present in high demand areas. Careem offers its service inside and around the main island and will continue expanding its services as it grows in Abu Dhabi. Will all car types be available in Abu Dhabi? Are services available for Now and Later booking? Currently, Max and Careem Assist can only be pre-scheduled through Later bookings and are not available for Now bookings. Other car types are available for both, Now and Later bookings. Can I keep the captain waiting? We offer 3 minutes of free waiting in every ride. Additional waiting on a trip is definitely possible and chargeable based on the car type. Will I get charged if I cancel my ride? A penalty is only charged when the cancellation is made more than 2 minutes after confirming a Now booking, or when the cancellation is made less than 1 hour before a Later Booking.